Today I am covering the September 2016 Adelaide Retro Computing group meeting with an Amiga theme. For this meeting we had special guests Trevor Dickinson from A-EON Technology and Robert Bernardo from Fresno Commodore Users Group fly in especially for the event! I didn't know we picked the same t-shirt to wear for the night! heh. Before the meeting I met up with Trevor (freshly flown in from NZ) and took him to Rundle Mall to grab a bite to eat. Rundle Mall is the main shopping district in the Adelaide CBD. We then made our way to the meeting venue. As we were a bit later than usual, George and Theo from the group committee helped out a bit earlier with the table setups ahead of our arrival. I then had to quickly assemble a very large array of Amiga stuff I brought for the meeting! I decided to bring an AmigaOne X1000, AmigaOne A1222 (Tabor), MIST FPGA (Minimig AGA), and a CD32 with the brand new Classic Amiga CD32 game called Reshoot I received this week - doesn't get much newer than that! It took a long time for me to set up, everything before the attendees arrived, but Trevor was very keen to start using the systems once I did! I first met Trevor at AmiWest 2014, and it was fantastic to have him here in Adelaide to enjoy our Amiga themed meeting this month! As mentioned Robert Bernardo from the Fresno Commodore Users Group also flew in from the USA to be here - he is also attending the Melbourne Amiga user Group and Sydney Amiga User Group events while he is here. Aron brought along his trusty Amiga 600 along with doing his usual soldering table duties (thanks for this Aron!). The Amiga 600 was running very nicely indeed with wireless internet access via a PCMCIA wireless adapter card. Mick works on and contributes lots of Amiga OS4 software ports, and so he is quite active in the NG Amiga community. Next up was this very cool expanded Amiga 600 system with built in CD drive! This Amiga 600 has a ACA620 accelerator installed, as well as a special modified laptop power supply, which bypasses the need to use a normal brick power supply. The event was well attended, and people quickly got chatting about all things Amiga and Retro computing! As this was the first time an AmigaOne A1222 had been displayed in Australia, Trevor was keen for people to see the system is a very capable system - it was busy running Amiga emulation, productivity apps and games too! One of the projects A-EON Technology is working on is the A.L.I.C.E laptop, which is A Laptop Incorporating a Classic amiga Experience. It runs on a standard Acer x86 laptop, and can run the Classic Amiga, AmigaOS 4.1 Classic experiences alongside your normal Windows or Linux installations. It can also run linux applications in a way (called Rabbit Hole) that integrates with the Classic Amiga setup, which is running AmiKit X. Here trevor is using Libre Office running on the Classic Amiga environment for the notes he is using during the presentation. After his presentation was finished, he kindly fielded questions from the attendees for quite a while, covering topics from Classic Amiga add ons like the Prisma megamix, where he explained the technical software development reasons for the delay of shipping this product (which makes perfect sense), and where A-EON is at with the AmigaOne X5000 and A1222. He even hinted at some future projects that he didn't expand on, but needless to say they are committed to the NG and Classic amiga platforms in 2016 and beyond. It is wonderful to have new systems and software being produced by them! It was a great presentation and we are very grateful to Trevor for taking the time for fly in especially for our event! It was snappy and performed well while I was mucking around with it. This is an exciting development, as it means we will be able to buy a standard laptop that can run other normal day to day computing needs in 2016, but can function as a Classic Amiga while doing it! Exciting indeed, and I look forward to when we are able to buy one! Moving back to the meeting itself, my NG Amiga table setup was getting quite the workout by this time, with brand new AmigaOS 4.1 game Amiga Racer with my requested Australian Holden Commodore HSV car being raced quite a lot on the night! 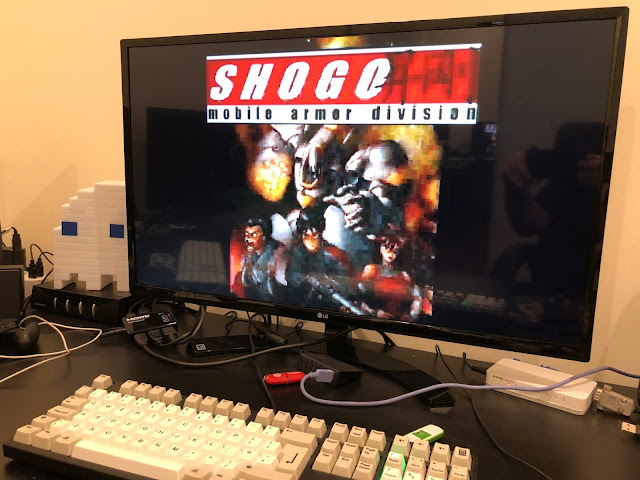 I covered the case and build of the AmigaOne A1222 extensively in this blog - this entry about the A1222 in the new case is worth checking out for the people (and there were many) that loved the case I put it in and wanted to know where to get it. Never actually seen one of these drives myself before, so I was glad to see it tonight! It was a truly great evening and I want to take this opportunity to thank everyone who came to the event and especially to our special guests Trevor and Robert! I had a great time and I am really looking forward to the next meeting! Thanks Robert for coming to our meeting this month - I hope you had a good time! Have a safe trip back to the US. Great report, really sorry I missed it. Nice ! I wish could join ! I believe im the only Amiga user here in Singapore.